Nicholas Vaughn is Lord of New Romney and also a Baron of the Cinque Ports. He directs a fleet of ships that service the king 15 days a year in exchange for special privileges. When Muriel Draper causes havoc on his wharf, he realizes she is a spinster—a woman who spins wool for a living—from the town. Her late father has angered the Clothmaker's Guild and now Muriel and her brother have been excommunicated from the guild and also left with a debt to the baron that he insists Muriel repays. She can either give the baron her deceased mother's wedding ring—the only memory of her parents she has left—or she can live with him at his manor house and be his Personal Clothier to pay back the debt. 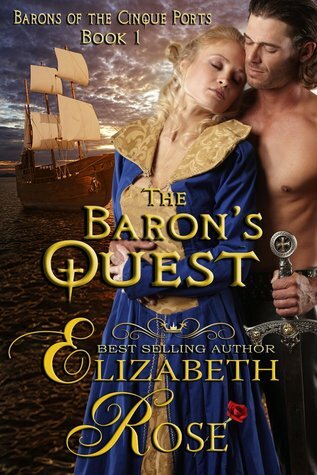 Can a merchant's daughter and a Baron of the Cinque Ports find a safe harbor with the passion for each other that burns between them, or will title and status sink that ship before it's even sailed? Muriel Draper is left alone to raise her younger brother after the murder of their father. She is broke and destitute and cannot pay her rent. Her father was a member of the merchant Guild but since he died owing them money, they have come and taken everything of value from her and banned her from the guild. Nicholas of Vaughn, Lord of New Romney, and also Baron of the Cinque ports, happens to also be Muriel's landlord and she is late in paying rent. Nicholas makes Muriel an offer to pay off the debt that she owes, which she reluctantly accepts. The story revolves around Nicholas and Muriel's budding relationship and feelings for one another as well the "mystery" surrounding the death of her father. As to the mystery itself, well there was no clenching of the stomach, biting nails, or skipping a few pages ahead to find out "who did it". My dog solved the mystery before I could take my next sip of tea! Now as to the love story (love being very loosely used here), I was almost halfway through the kindle edition, with only a kiss here and there, no declarations of any kind even mentioned yet. Muriel is a merchant's daughter, having no dowry, with the exception of her mother's ruby ring, which she understandably can not part with. Nicholas is a baron, who's father and brother expect him to marry according to his station. At one point Muriel is told by her best friend that it is an "honor" just to have the Baron consider her as a mistress (the medieval thinking never ceases to amaze me). Nicholas is at war with his feelings; he wants Muriel and feels she is a true lady, yet he is embarrassed to acknowledge his feelings. He seems at times a bit shallow. He has to have the finest clothes and materials and he is shamed by the fact he does not have a "real" castle like his friends do. Muriel is desperate to provide for her and her brother, which I understand. However, once she had secured a position within Nicholas' household she still does foolish, impetuous, childish things. Muriel not only endangers herself, but those that she claims to care about, putting them in jeopardy with her foolish behavior, and it is those friends that have to suffer the consequences of her actions. I did not warm up to Muriel's character, and I could never completely fall for a "hero" who is embarrassed to publicly admit his feelings for me. I want an alpha male in every sense of the word! One redeeming quality of this book was that I learned something that I did not know before. I enjoyed learning the history of the Cinque ports much more than the actual story. I would recommend this to anyone who wants to learn about medieval history, but if you're looking for a good passionate romantic story with lots of chemistry. continue looking.